...re-check all water conditions in your tank to make sure that environment did not play a factor in this problem, or think about the animal's companions in the tank.. I just purchased this starfish yesterday...the owner said it was it good condition and that it was just shedding its skin, but now I am not so sure. I acclimated it to the take using a drip method and moved around fine but red stuff is coming off from it..and it has this spot on it and I have no idea what it is...it had to yesterday when I bought it, but now I am not sure if it is healthy. If it isn't I want to get it out of the tank quickly so not to kill my other fish. nitrates and ammonia is 0 salinity level is 1.025. Please help me. Thanks for the quick reply :) The crazy thing is...it is very active...I don't think I can remove him from the tank yet..because he has wedged himself have in and out of a rock....should I wait until he comes back out and put him into a bowl? 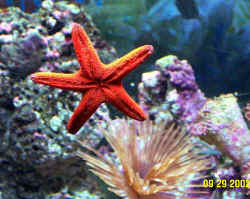 Thank you so much...starfish is safely removed from my tank and is now in a bucket....my daughter really wanted a starfish....after getting this one I really did not know what I was in store for. 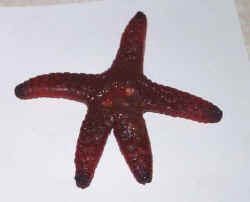 Is there any particular starfish that is more hardy? 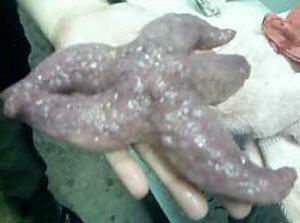 She originally wanted a purple beaded starfish. 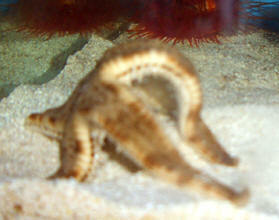 Re: Need help with my sea star, sand-sifter (Astropecten spp.) 3/3/07 Thank you Mich. <You're welcome Nikki.> Sorry I was really tired, and then really worried. I tend to get scatter brained. <I understand, I have been guilty of all too often.> It didn't have another missing "leg" It was just buried in a way that looked like it was cut off. <OK.> I'm thinking that a coral I have might have fallen on him to cut off the arm/leg. <Possible.> The arching up it's still doing. I think it might be doing this to get more food? <Seems unusual to me.> We feed every other day the DT's and the frozen cubes.. I also make sure I put some into the sand, as I am worried that it's not getting enough food. <Yes, unfortunately the nutritional requirements of these creatures aren't well understood.> The everything being amonia-0 n-rate-0 n-rite -0 hydrometer-31 cal-390 Thank you for your help. Also might the arching be it trying to feed? <I don't think so, typically feed by sifting the sand.> Thanks again.